This simply means that if we were to convert 1 of our bonds outstanding to the company’s stocks at the conversion price of $50/share, we would end up getting 20 shares of common stock of Jahmani Corp. 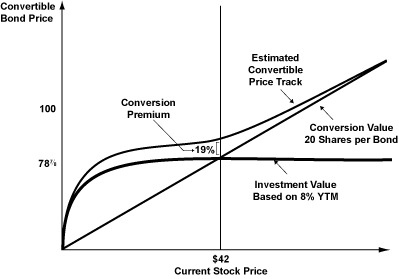 However, notice that the current stock price is lesser than the conversion price of $50/share; it is at $41/share. So how do we know the current value of our convertible bond? We can know this by multiplying the # of shares multiplied by current stock price. This simply means that if the investors want to convert their current bonds in to the common stock of their issuing company’s shares, they will have to pay a 19% conversion premium in order to obtain the stocks at 100% of its fair value.